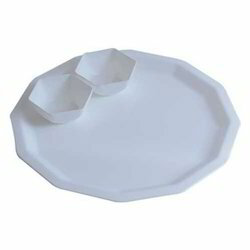 We are among the eminent traders and suppliers of Dinner Plate Set. This product is available in hammered and plain finish, and perfect suits any dining set up. Our plate collection is available in half, full and quarter sizes. Added hammered glass set is also available for making complete dining set up. 6 PCS Nikki Full Plate Set in Color Box D W.
These stainless steel thali set are made from very high quality stainless steel raw material which ensures high durability at its user end. 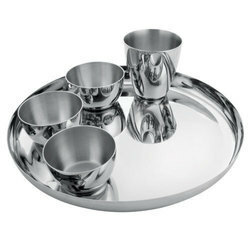 These stainless steel thali set are available in various designer patterns and designs. 7pc, Stainless Steel. Our organization is instrumental in designing and offering an eye-appealing range of pure Transparent PlateSet. Having mesmerizing looks almost similar to glass, our range enhances the beauty of any dinner table. We make sure that these plates are delivered after a strict check of their quality parameters.